Maria Pacheco, 37, and husband Jose Villagrana, 41, grew up in Pasadena and always wanted to camp out along the parade route as kids, but never got to. Now, they make it a tradition with their three children, two boys ages 16 and 12, and an 8-year-old girl. This year, they staked out their spot near the intersection of Colorado Boulevard. and Oak Knoll Avenue since 6 a.m. Sunday. "We try and say, 'No, we're not going to do it this year,' but they don't take no for an answer," Maria said, laughing. They said knew about the added security this year, but they didn't think twice about coming. They also watched the weather and said they lucked out -- they only got sprinkled on a little bit Sunday night. 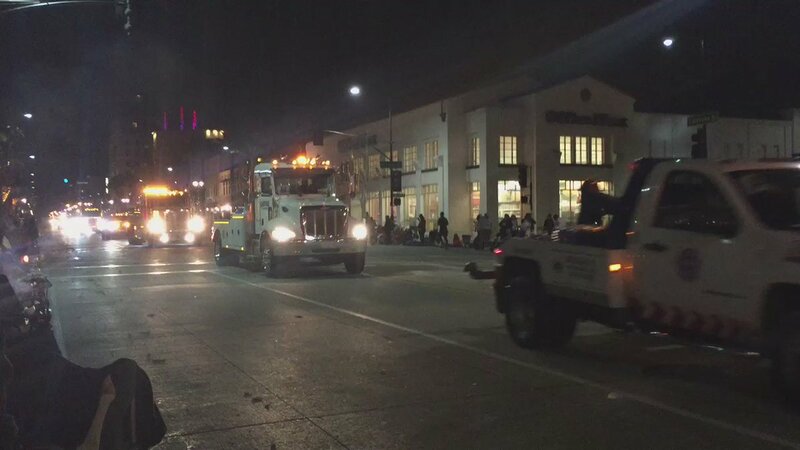 At 5:39 a.m., more than a dozen tow trucks, headlights on, paraded down Colorado, horns blaring. A man in one of them yelled, "Good morning!" "The wakeup call!" Jose said. "They do it every year." He then pumped his arm at one of the trucks, grinning and trying to get it to honk.